The American Medical Association publishes a PDF guide to collecting denied claims called Appeal That Claim. The handbook, in the Overview section notes that many practices do not make the effort to appeal denied claims. Though the reasons are numerous, the AMA says the most common reason is that doctors do not believe they will recoup enough from appeals to justify the administrative expenses a denial management process will impose on the practice. These physicians are 100 percent mistaken. The AMA cites the example of a Chicago practice that could have recouped $91,000 for one procedure that over a period of three years the insurer denied incorrectly. All the practice needed to do was audit and appeal the denials. Examples abound concerning how a denial management process can significantly enhance a medical practice’s bottom line. Since insurance companies and providers have a common purpose when it comes to claims payment, the electronic exchange of information, where all the parties understand billing codes, diagnostic codes, modifiers, and basic demographics is efficient. But, when an insurer denies a claim, billing specialists are not as familiar with the codes used, or at least the reasons for a particular code applied to a claim. This is fine with the insurance company as they are hoping that the office fails to appeal or at least fails to appeal on a timely basis. What is a Denial Management Process? Those physicians who do not believe they could recover enough reimbursement through a denial management process, are likely not aware of a report that found in California, health insurers reject one out of five claims. According to the Los Angeles Times, this information comes from the California Nurses Association, who audited seven years of information submitted to regulators by insurance companies. The purpose of a Denial Management Process is to investigate every unpaid claim, uncover a trend by one or several insurance carriers, and appeal the rejection appropriately as per the appeals process in the provider contract. In many cases, the rejection code used on a claim and the actual reason for rejection are not related. The Denial Management Process seeks the root cause for the denial as well as the coded cause. Logic would say that frequent claims denial due to “late filing” indicates that there is a problem getting with the medical billing department. It is just as possible that the problem actually is at the registration desk, which is at the beginning of the revenue cycle management process. Causes may be failure to verify insurance, no referral, or an error in registration. So a key feature of the process is to investigate every instance where no pay or lower than expected pay occurs. 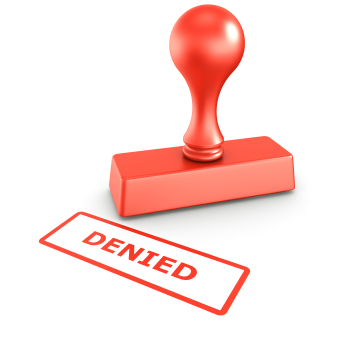 An important goal for a Denial Management Process is to lessen the number of denials. Therefore, the process begins at the reception desk. Offer patients pre-registration by sending them a packet with a return envelope before their appointment. This allows the office to verify insurance before the office visit. If the patient does not send the information in prior to the appointment and reception cannot verify insurance, offer to reschedule the appointment. If a patient requires a referral and does not have one, reschedule the appointment if approval is unobtainable. Correct demographics are vital to payment, get a photo ID, and verify the address. Have a patient sign an acknowledgement that if insurance does not pay they may be responsible for payment. Providers that follow best practices track denial reasons or lower than expected reimbursement when posting payments. If tracking uncovers a trend, providers or other appropriate personnel are informed so that procedures can be developed to avoid future denials. To manage denials, quick follow-up is a necessity. On a regular basis, distribute denied claims to billing staff for management. In large practices, this should happen every day. All correspondence is read daily for changes in billing or reimbursement policy from providers. This gives provider the opportunity to amend their policies and procedures to avoid denials. Make sure to follow the insurance carrier’s requirements for appeals. Otherwise, duplicate claims can occur. Use denial codes to educate medical billing staff when there is a denial due to incorrect medical coding. If you do not have the resources to handle Denied Claims Management in your medical billing department or are not achieving satisfactory results, call RevenueXL now at 888-461-9998 to learn how we can help.